You are looking at documentation for an older release. See the current release documentation. Most of the components in Kubernetes control plane export metrics in Prometheus format. The collector can read these metrics forward them to Splunk Enterprise or Splunk Cloud. Our installation has default configurations for collecting metrics from Kubernetes API Server, Scheduler, Controller Manager, Kubelets and etcd cluster. In most Kubernetes providers you don't need to do additional configuration to see these metrics. 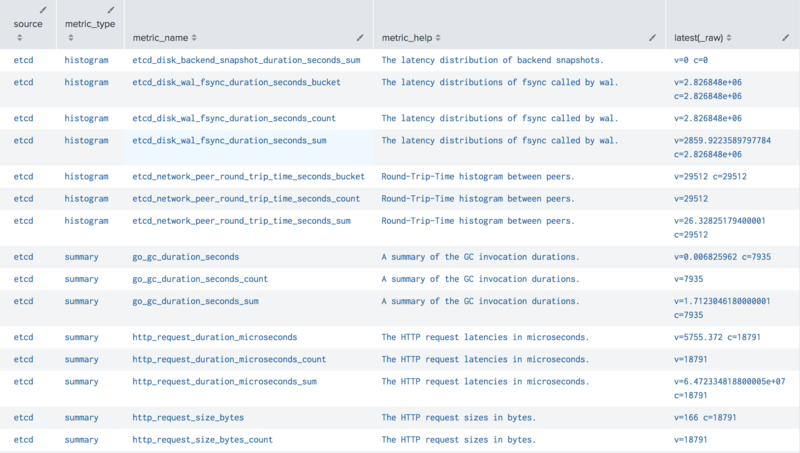 If your applications export metrics in Prometheus format, you can use our collector to forward these metrics as well to Splunk Enterprise or Splunk Cloud. We deploy collector in 3 different workloads. Depending on where you want to collect your metrics, you should plan to include you Prometheus metrics. 002-daemonset.conf is installed on all nodes (masters and non-masters). Use this configuration if you need to collect metrics from all nodes, from local ports. Example of these metrics is Kubelet metrics. 003-daemonset-master.conf is installed only on master nodes. Use this configuration to collect metrics only from master nodes from local ports. Examples of these metrics are control plane processes, etcd running on masters. 004-addon.conf installed as a deployment and used only once in the whole cluster. Place your Prometheus configuration here, if you want to collect metrics from endpoints or service. Examples of these Prometheus configurations are controller manager and scheduler, which can be accessed only from an internal network and can be discovered with endpoints. Another example is etcd cluster running outside of the Kubernetes cluster. On every node collector reads and forwards kubelet metrics. We deploy this configuration in 002-daemonset.conf. # token for "Authorization: Bearer $(cat tokenPath)"
On master nodes collectors reads and forwards metrics from the kubernetes API server. We deploy this configuration using 003-daemonset-master.conf. On master nodes collectors reads and forwards metrics from the scheduler. We deploy this configuration using 003-daemonset-master.conf. The collector will be able to forward metrics from scheduler only if scheduler binds to the localhost on master nodes. In case if scheduler only binds to the pod network, you need to use a different way of collecting metrics from the scheduler. In 004-addon.conf you can find commented out section [input.prometheus::scheduler], that allows collecting metrics from the scheduler using endpoint discovery. You can comment out section [input.prometheus::scheduler] in 003-daemonset-master.conf and uncomment in 004-addon.conf. In this configuration, the collector is using endpoint endpoint-http://kube-scheduler-collectorforkubernetes-discovery:10251/metrics, that syntax defines endpoint auto-discovery, it is listing all endpoints with port 10251 defined under name kube-scheduler-collectorforkubernetes-discovery and using all endpoints to collect the metrics. Endpoint kube-scheduler-collectorforkubernetes-discovery is created with service, defined in our configuration. On master nodes collectors reads and forwards metrics from controller manager. We deploy this configuration using 003-daemonset-master.conf. The collector will be able to forward metrics from controller manager only if controller manager binds to the localhost on master nodes. In case if controller manager only binds to the pod network, you need to use a different way of collecting metrics from the controller manager. In 004-addon.conf you can find commented out section [input.prometheus::controller-manager], that allows to collect metrics from the controller manager using endpoint discovery. You can comment out section [input.prometheus::controller-manager] in 003-daemonset-master.conf and uncomment in 004-addon.conf. In this configuration, the collector is using endpoint endpoint-http://kube-controller-manager-collectorforkubernetes-discovery:10252/metrics, that syntax defines endpoint auto-discovery, it is listing all endpoints with port 10252 defined under name kube-controller-manager-collectorforkubernetes-discovery and using all endpoints to collect the metrics. Endpoint kube-controller-manager-collectorforkubernetes-discovery is created with service, defined in our configuration. On master nodes, collectors read and forward metrics from etcd processes. We deploy this configuration using 003-daemonset-master.conf. This configuration works when you run etcd cluster with master nodes. With this configuration, collector tries to collect metrics using http scheme at first, and https after that. For https collector uses certPath, clientCertPath and clientKeyPath, which are mounted from the host. You can find these arguments by executing ps aux | grep apiserver on one of the master node, or try to find the API Server definition under /etc/kubernetes/manifests/kube-apiserver.yaml. If your etcd cluster is a dedicated set of nodes, you can define prometheus collection in 004-addon.conf. Prometheus defines several types of metrics. metric_type - one of the types from the Prometheus metric types. metric_name - the name of the metric. metric_help - only if includeHelp is set to true, you will see definition of this metric. metric_label_XXX - if the metric has labels, you will be able to see them attached to the metric values. seed - unique value from the host for specific metric collection. Based on the metric type you can find various values for the metrics. If you have specified to include help with the metrics, you can explore all available metrics with the search. Outcold Solutions provides solutions for monitoring Kubernetes, OpenShift and Docker clusters in Splunk Enterprise and Splunk Cloud. We offer certified Splunk applications, which give you insights across all containers environments. We are helping businesses reduce complexity related to logging and monitoring by providing easy-to-use and deploy solutions for Linux and Windows containers. We deliver applications, which help developers monitor their applications and operators to keep their clusters healthy. With the power of Splunk Enterprise and Splunk Cloud, we offer one solution to help you keep all the metrics and logs in one place, allowing you to quickly address complex questions on container performance. Copyright © 2017-2019 Outcold Solutions LLC. All Rights Reserved. Made with care in Kirkland, WA, USA.